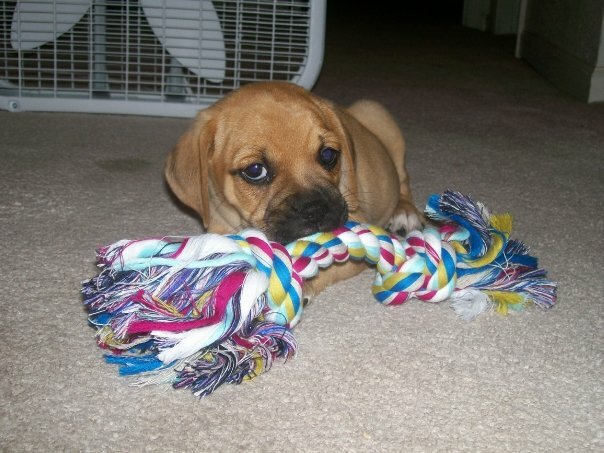 I’m Riley the Puggle. Don’t let that picture fool you, I’ve grown up a lot since mom & dad first brought me home. I’m almost 4 months old, and I think that means it’s time I start my own blog like some of the other super cool puggles on the world wide web. Us puggles are extremely smart, you know, so we might as well be bloggers. I’m cool with updating you guys on my adventures, just as long as it doesn’t interfere too much with my napping. I really like to learn new tricks, play in the back yard, dig holes, and play with my best friend and sometimes girlfriend, Mocha. She’s an Australian Shepherd and Terrier mix, but my parents and her parents call her a Sherrier because they thought she should have a designer dog name too! I’m being a devil for halloween. Mom & Dad took me to one of the local animal shelter’s charity photo shoot in my costume, and the pictures should be back this weekend! They’re fortunate they got a shot of me standing still! It was a pet shop with a lot of other dressed up dogs, for barkness sake! What’s a puppy supposed to do?! In other news, i’m getting “fixed” on Monday. Mommy and Daddy tried to explain, but i’m still not sure I understand. Am I broken? I just hope the vet has plenty of treats and doesn’t try to clip my nails while i’m there. I hate that!